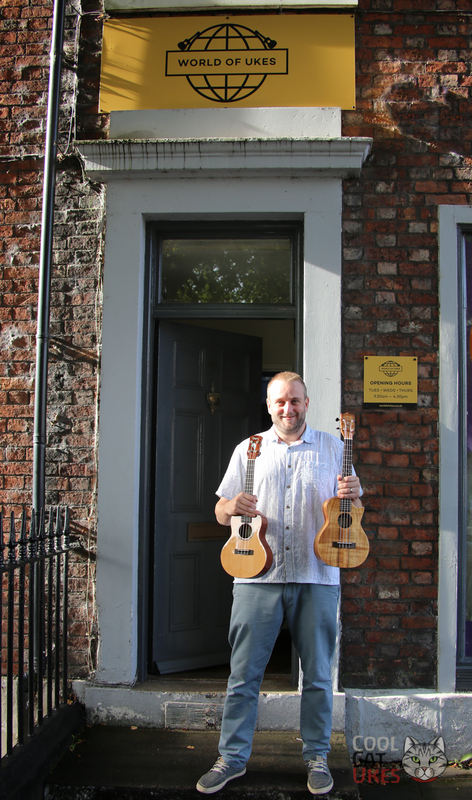 We dropped in to see Matt at his new World Of Ukes store in central Carlisle. Well worth a visit, some of the loveliest ukuleles you could ever hope to see, all under one roof. So easy to compare them side by side. It's a relaxed place, with some comfy chairs where you can noodle around and make your decision. They have accessories there too, and Matt is on hand with honest and knowledgable advice of course. You can find the store at 48 Cecil Street, Carlisle, CA1 1NT. World Of Ukes also have a mail order website at www.worldofukes.co.uk, where you can browse and research these amazing ukuleles. My favourites? The Kala Comfort edge concert and their (nicely loud) scalloped cutaway ukes and the Uluru Kohola IIIC that was also Liam Capper Starr's favourite. While we were there, we also recorded this (a bit silly) song as a bit of a tribute... You might recognise the tune. I love the way "aNueNue" pans in the song! Looks like it's an amazing place, but they have one thing missing. A cat.